After Week 11 last season, yours truly proclaimed the Miami Dolphins to be the best defense in the NFL. Over the next six weeks, the Dolphins made a mockery of that. Take out the Week 13 Monday night contest in which the Jets decided not to throw against them, scoring only 13 points, and the Dolphins allowed a staggering 36.0 points per game down the stretch (including 37 in a home loss to those same Jets in the season finale). They went 2-4 to finish the season 8-8, par for the course in their three years under head coach Joe Philbin. Before their face-plant, the Dolphins had been allowing 18.0 points a game, third best in the NFL. So what happened? And, to cut to the chase, does spending $60 million in guarantees on Ndamukong Suh take care of it? Your answer to those questions reflects your core football values. Go back to those final six weeks. The secondary took a step back. Injuries to veterans like cornerback Cortland Finnegan (who has since retired) and free safety Louis Delmas cast inexperienced youngsters and even a midseason street free agent—cornerback R.J. Stanford—into the starting lineup. Miami’s run defense also sputtered, as it has been wont to do late in the season during Philbin’s tenure. However, the run defense woes were only for the first three of those awful last six weeks. And in one of those weeks—the first Jets game—the Dolphins were victorious despite allowing 277 rushing yards. They surrendered 201 yards on the ground to the Broncos and 183 to the Ravens, both losses, but then held opponents to a respectable 110.3 rushing yards per game over the final three weeks. To pin the downfall on the run defense is to oversimplify the problem. There’s also an argument to be made that the Dolphins were never the league’s best D in the first place, and that they had weaknesses all along that simply caught up to them. They were somewhat average in the secondary and had had injuries at linebacker earlier in the year. Or there’s this: The Dolphins, despite the injuries, still had an adequate, in many spots even above average, collection of players—the problem was they didn’t dictate the terms of engagement often enough. Though well-versed in coordinator Kevin Coyle’s Bengals style double-A-gap pressure packages, the Dolphins did not generate game-wrecking pressure on opposing quarterbacks. Top pass rusher Cameron Wake had 11.5 sacks, but counterpart Olivier Vernon had just 6.5, which still ranked second on the team. All-around, both were quieter than they’ve been in recent years. The team’s 39 sacks tied for 16th in the league. Forced to play in reactionary mode, Miami’s back seven was bound to be exposed eventually. • TODD BOWLES HAS NO LIMITS: Even more than Rex Ryan, the new Jets coach is a defensive maverick who might be crazy enough to turn things around in New York. Of course, the “new” cornerbacks are a huge plus. So instead of paying $17 million in guarantees to re-sign underrated defensive tackle Jared Odrick (who joined Jacksonville) and just $3 million in guarantees to retain Randy Starks (now in Cleveland), GM Dennis Hickey and his new cohort, former Jets executive Mike Tannenbaum, shelled out the $60 million for a certain soft-spoken, hard-biting ex-Lion. Suh, we know, can penetrate. And nothing wrecks an offense like penetration. But just how much should the pursuit of it cost? According to OverTheCap.com, the Dolphins in 2016 will be spending 18.45% of their salary cap on Suh. (The next highest percentage on a defensive lineman in 2016 is the Bucs spending 8.4% on Gerald McCoy.) Miami’s defensive line as a whole costs more than the rest of its linebackers, safeties and corners put together. And so it comes as no surprise that the back seven heading into this year looks about as weak as it did heading out of last year. In revamping the D-line (the Dolphins also drafted nose shade Jordan Phillips in the second round), Hickey and Tannenbaum are essentially doubling—actually, at $60 million over $20 million, tripling—down on the old adage that games are won and lost in the trenches. It’s hard to argue with that; we’ve seen many great defenses ride a strident front four deep into the playoffs. Hickey witnessed this firsthand as a member of Tampa Bay’s scouting department in the late 90s. And, though constructed differently, Tannenbaum’s AFC Championship defenses with the Jets were stellar up front. It’s not just about what Suh does for “the front.” Flanked by Wake and Vernon, Suh fundamentally changes the job descriptions for others on defense. With the ball now likely to come out of the quarterback’s hands quicker, corners don’t have to hold their coverage as long. And someone like strong safety Reshad Jones can build on his 2014 career year (yes, it was a career year, even if “stats” don’t reflect it) by taking more chances when rotating down into the box. Passing lanes can be jumped. Linebackers who last year had to prepare for pressure concepts in Coyle’s system can now spend more time practicing and studying coverage. Because with Suh, sending extra pressure is rarely needed. Not only can the 307-pounder penetrate, he’s also the best in the business at attacking blockers to set up stunts and twists for fellow defensive linemen. This is why the Lions rarely blitzed when they had Suh. Of course, the counter argument is that the Lions never won anything of substance with Suh. In fact, their 2014 playoff appearance—just the second of Suh’s tenure—came on the strength of a defense that, under new coordinator Teryl Austin, started doing more with pressure packages than under previous regimes. There are no true apples to apples comparisons between NFL teams, but the defensive lines Suh played on in Detroit and the one he’ll play on in Miami come pretty close. Both surrounded the perennial Pro Bowler with quality gap-shooters. One must also consider the age-old concern about big-ticket free agents: when you sign one, you’re getting him on the verge of a career downswing. Suh is only 28; he won’t hit a wall anytime soon. But he is unlikely to get much better, either. And now having registered nine figures in guaranteed earnings in his career, you can’t help but wonder about his motivation. Though not personally liked by all, Suh is respected by peers and is reputed as a prideful competitor. Most likely, he will not become the next Albert Haynesworth. Still, Miami’s coaching staff ought to review that chapter in Washington’s franchise history. In 2009, Haynesworth, like Suh, a dominant three-technique, signed in Washington for what was at the time a record-shattering $41 million guaranteed. Upon arrival, the team tried converting him into a one-technique, much to his chagrin. Being assured $41 million for his services, any man with a modicum of integrity would have bucked up and give 100% no matter how displeased he was. But instead of becoming possibly the best one-tech in the league, Haynesworth essentially said, Why the hell should I? For the small price of what remained of his presumably shallow self-honor, he could phone it in, keep his body unbattered and be safely out of the league, healthy and rich, by 30. Still, Washington can be faulted for a mistake that Miami can learn from. The Dolphins must emphasize Suh’s greatest strengths, which for him, as with Haynesworth, means being a penetrator. Suh doesn’t have to always play the three-technique; in fact, in Detroit, he was extremely effective when lined up as a defensive end, and he was an important cog in the few snaps he spent as a nose shade. But wherever he lines up—and it will indeed be the three-tech most of the time—he needs to be a featured part of an attack. Rarely if ever should the Dolphins ask Suh to simply stalemate two blockers and plug gaps. In the end, there are only so many things you can do with one defensive player. The Dolphins are hoping that this number of things outweighs the number of soft spots that Suh’s presence has left in the rest of their defense. 1. If Ryan Tannehill can become a more consistent and precise passer, he has a chance to be a top-10 quarterback. He’s already top 10, if not top five, in mobility. Second-year coordinator Bill Lazor will continue featuring this in his Eagles style system. As a pure passer, Tannehill is more mechanically sound than, say, Cam Newton, which is why he’s increasingly steadier in and out of the pocket. He’s also cast in a system that will unburden him by calling a lot of quick-timing throws. The Dolphins were wise to sign the now-27-year-old to a long-term contract this past offseason. 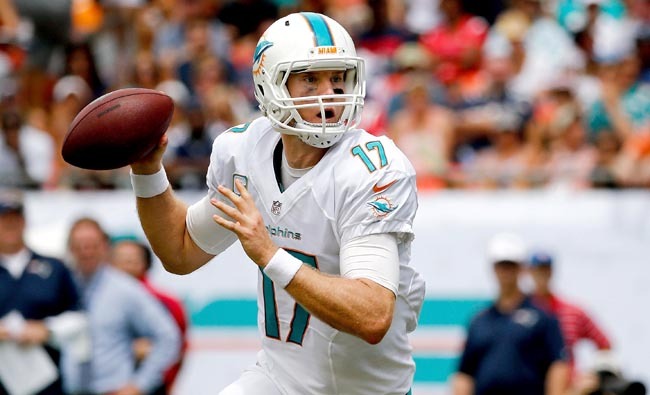 Tannehill’s value is poised to jump this season. 2. A year ago, Tannehill was strapped with a receiving corps that was lethargic in spots and unreliable in others (pretty much wherever Mike Wallace lined up). Now, running a three-receiver base offense, Miami might have the most complete receiving corps in the NFL. They drafted Louisville’s DeVante Parker in Round 1 and traded for smooth former Saint Kenny Stills, who can provide a potent vertical element within the context of an offense. They also signed 10-year veteran Greg Jennings from Minnesota. Jennings has caught at least 59 balls in each of the last seven years (excluding an injury riddled 2012 campaign in Green Bay), but he may not even get on the field considering big-bodied Rishard Matthews is a more unique matchup creator at No. 4 and second-year slot man Jarvis Landry is too good in space to sit for longer than the occasional breather. Several of these receivers will have to settle for smaller numbers; with ex-Browns tight end Jordan Cameron also arriving via free agency, there simply won’t be enough catches to go around. That’s a great problem to have. 3. Lazor’s scheme is similar to Chip Kelly’s, only with more pre-snap motion and shifts. The Dolphins are more experienced in it now, and with their offensive line woes not fully corrected but amended enough to keep most pages of the playbook alive, this could be one of the league’s most difficult offenses to gameplan against. 4. A name to keep in mind: Damien Williams. The undrafted second-year running back plays with a burst, most evident in the passing game. He won’t supplant fourth-year finesse back Lamar Miller, but he should warrant 10-12 meaningful snaps a contest. 5. A guy on this defense worth mentioning but who hasn’t been covered is weakside linebacker Jelani Jenkins. The 2013 fourth-round pick has near sideline-to-sideline speed and innate quickness in the box. He’s also adept in most coverage situations.